Grime was a French art rock band formed in the mid-seventies. Didier Duval chose Grime as their name because in Greek theater it signifies an actor made up as an old man. This image intrigued him and he tried to incorporate it in their live performances. Intended for sale at their concerts, their first and only album was initially a privately released limited edition LP of 1000 copies. 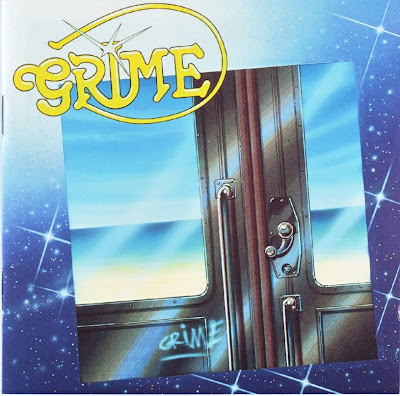 Conceived as a concept album, Grime tells the story of a man on a subway who discovers that he can no longer get off. After falling asleep he awakes and looks outside to find the train stranded on a beach. This confusion between dream and reality is the departure for a musical odyssey to worlds of the fantastic. In the end the man wakes to find that he is still on the train in the same dull world. Grime's music is an example of French progressive rock with a subtle blending of poetry, music, and theater. Their music is a mixture of complex melodies, vocals, and instrumentation similar to other popular contemporary progressive bands: Camel, Genesis, H. P. Lovecraft, King Crimson, Le Orme, and Supertramp. Only the brutal opening song "Cauchemar" (Nightmare) stands apart from the rest of the music. This punk influenced song opens with French shouting representing the trapped man's awareness of his dilemma. This CD reissue contains six live bonus songs recorded at the "Panespo Club" in Neufchatel, Switzerland on 12 December 1981. The live music recorded 2 years later documents their growth as musicians and as a band. Grime's music is great. They give good sax but no violins!